The National Football Foundation (NFF) and College Football Hall of Fame announced the 2017 ballot on Wednesday and former University of Oklahoma standout Rickey Dixon earned a spot as one of 75 players listed from the Football Bowl Subdivision. 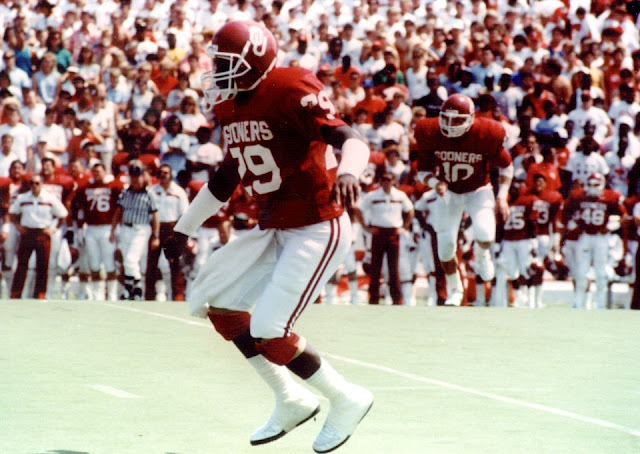 A 1987 consensus All-American, Dixon became the first Sooner to win the Jim Thorpe Award, given to college football's top defensive back. He earned first-team All-Big Eight honors as a junior and senior in 1986 and '87, and finished his career with 170 total tackles and 17 interceptions. The 17 career interceptions are one shy of the OU record while his nine picks in 1987 still stand as the school single-season standard. Dixon's four OU teams went a combined 42-5-1 and played in the Orange Bowl each season. The 1985 squad beat Penn State in the Orange Bowl to claim OU's sixth national championship. "It's an enormous honor to just be on the ballot when you think that more than 5.12 million people have played college football," said NFF President & CEO Steve Hatchell. "The Hall's requirement of being a first-team All-American creates a much smaller pool of only 1,500 individuals who are even eligible to be on the ballot, so being in today's elite group means an individual is truly among the greatest to ever have played the game, and we are proud to announce their names. We look forward to announcing the 2017 Hall of Fame Class on the Friday before the College Football Playoff National Championship in Tampa." Dixon was the star of the "Game of the Century II" in 1987, with Nebraska rated No. 1 in the country and OU ranked No. 2. The Dallas product intercepted two Huskers passes, the second of which came in the fourth quarter to help seal OU's 17-7 road win and OU's Orange Bowl berth. Dixon was selected No. 5 overall in the 1988 NFL Draft by the Cincinnati Bengals. He played in the league for six seasons with the Bengals and Los Angeles Raiders, and made an appearance in Super Bowl XXIII with Cincinnati against the San Francisco 49ers. The announcement of the 2017 Class will be made Friday, Jan. 6, 2017, in Tampa, Fla. The city is serving as the host for the CFP National Championship, which will be played Jan. 9 at Raymond James Stadium. The 2017 class will be inducted at the 60th NFF Annual Awards Dinner Dec. 5, 2017, at the landmark Waldorf Astoria Hotel in New York City. The inductees will be permanently enshrined at the new College Football Hall of Fame in Atlanta later that December and honored on the field during the 13th Annual National Hall of Fame Salute during the Chick-fil-A Peach Bowl.